A toy is a perfect gift for kids, and there is a lot of selection to choose from, it could be cars, board games, dolls, action figures, the choices can be limitless. With the advancement of technology, toy companies developed toys that can be controlled with a remote and the most common type of this assortment of toys are the remote vehicles like cars, aeroplanes, and more. 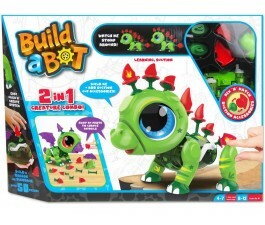 Also remoted controlled robots are available online and in stores that you can purchase for your kids. Admittedly, it will bring endless fun for your kids. Mr Toys offers Best Prices for Remote Controlled Robots Undoubtedly, your kids will enjoy their remote-controlled robot figures. They can play it with friends or alone, and practice the skills of their robots. These remote-controlled robots are available in friendly and playful designs. Purchase now and give your kids limitless fun. To get the best deal, check out the products available online or in our stores countrywide. What are you waiting for? Get an effortless shopping experience as you can purchase through our website. Are you curious what is like to build your robot? Now you will know what it feels and look like when you purchase this fantastic toy of Meccano. Mecano Toys encourage your child's building and motor skills to bloom. Choose from various construction sets that will challenge children and adults' ingenuity. From pieces to robots, children of varying ages will be so proud to see the fruits of their labour. Meccano products only at Mr Toys Toyworld. Shop today!